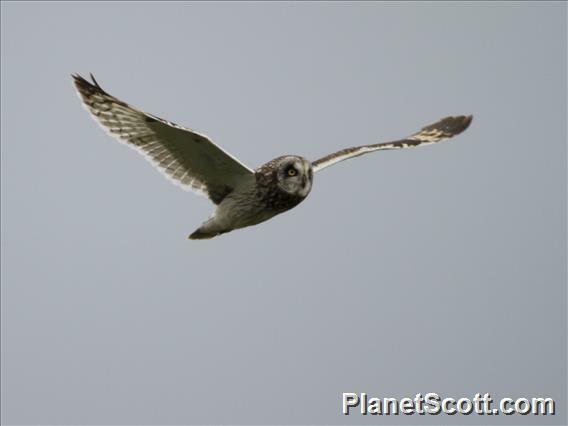 Unlike most owls, you see short-eared owls flying also during the day. Their flame-colored plumage is easy to recognize in daylight. It's no coincidence that their Latin name describes this feature (flammeus). Short-eared owls are the only species of owls in the Netherlands that build their own nest. It's no more than a hollow, lined with grass and hidden in the vegetation. During years with lots of voles, these owls will lay as many as a dozen eggs. They protect their nests from predators using the cripple-wing technique: pretend to make an easy prey by walking around with a 'wounded' wing, thusly fooling the intruder and taking its attention away from the nest. Fairly common on Saddle Road.